Ed Asner: "A Man and His Prostate"
How Improv Can Not Only Make You Laugh, It Can Change Your Life. Laughter: Is it Really the Best Medicine? Pack the Pub at Creston Brewery! LaughFest 2019 is right around the corner, and we want YOU to be involved. LaughFest brings more than 50,000 people into downtown Grand Rapids at a time of year that’s cold and icy and distinctly un-funny outside. Partnering with LaughFest enables you to create visibility for and traffic into your business at a traditionally low time of year, all while helping raise awareness and funds for Gilda’s Club Grand Rapids. All proceeds of LaughFest help finance the free cancer, grief and support programs offered through Gilda’s Club Grand Rapids and 100% of those funds remain local. Our education, support and social activities rely entirely on charitable gifts and allow children, adults, families and friends to find their smile and laughter back in the midst of a cancer or grief journey. If you are interested in learning more about partnering with LaughFest, contact Mitch Neubert at mneubert@laughfestgr.org or by calling 616-453-8300 x111. Celebrate all things jovial with Cherry Chuckle. Vander Mill has blended their delicious cider with Michigan Balaton Cherry juice for an experience that is slightly sweet, refreshingly tart and sure to leave you smiling! For every pint or four pack purchased, Vander Mill will donate $1 to benefit the free cancer, grief and emotional health program offered through Gilda’s Club Grand Rapids. 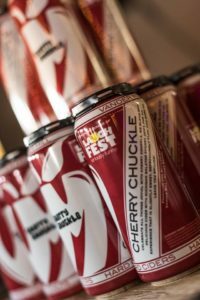 You can pick up Cherry Chuckle at both Vander Mill Grand Rapids and Vander Mill Spring Lake! Vander Mill began in 2006 as a traditional cider mill. Vander Mill began distributing their hard cider in 2008, expanding their facility in Spring Lake in 2013. Vander Mill is now distributing product in convenience and grocery stores, bars and restaurants throughout Michigan, Illinois, Indiana, Ohio, and Wisconsin. With the opening of their 40,000 square foot production facility and restaurant in Grand Rapids, Michigan, in April 2016, Vander Mill is experiencing their biggest expansion yet preparing to meet the demands of the existing market and seeking new opportunities. Vander Mill prides itself on building relationships and with on and off premise retailers in each market. Vander Mill continues to grow the love for cider one can or glass at a time. Enter your email address to receive LaughFest updates.